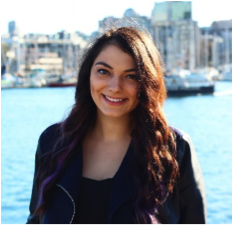 “After graduating from SFU, I was working full-time for the same company I’d done two of my co-op terms with. About six months after convocation, I began mulling over the decision to stay or leave. I was trying to figure out my next step in terms of my career and professional development. This proved to be much harder than I ever thought it would be. I really loved my job and everyone I was working with. But after many sleepless nights, I ultimately came to the decision that I needed to experience something different. I was terrified of the thought of getting myself pigeon-holed in one industry or job. Coming to this decision wasn’t easy. What kept me up at night was my fear of not being able to find the same dynamics and great people that I had been working with. More than anything, I wanted to find an environment where creativity was valued and where the only constant was change. My worst fear was making the wrong choice. I didn’t want to end up in a position that turned out to be completely different than I had anticipated. When you are fairly new to the industry, it’s often difficult to set benchmarks or expectations simply because you might not know a lot of people or have enough experience to compare with. And I just didn’t want to end up unhappy. I was involved with IABC quite a bit in a volunteer capacity, helping organize events. And around the time I was thinking of making the switch, they held a career workshop for volunteers. The timing could not have been more perfect, so I took this as a sign to get my ducks in a row. One of the sessions at this workshop was a discussion about resumes. The facilitator, Lydia Tay, was also an IABC member with experience in recruiting, so she offered to review a few resumes with the whole group. Three people volunteered. I remember sitting there around the table, glancing over at their documents and having this dark cloud of fear creep over me. Our resumes could not have been more different. Their resumes were all two or three pages long, extremely detailed, and formal. Mine was a one-pager. It had my logo in the corner, which is a little purple and blue water colored brain. At the end of the day, it contained almost the same information that everyone else presented, data, hard facts, how you contributed to your job. The only difference was format and the way I chose to present the details. Cue the panic. By the time my heart stopped racing, the session had wrapped up and my resume was still quietly tucked away in my folder with no eyes on it. Before that moment, I was very proud of my resume. I thought it expressed my personality and what I bring to the table but I couldn’t help but feel a bit conflicted. I didn’t necessarily know what the right way to go about this was, or if there even is such a thing as a right answer. Yet there I was, thinking that all these people have great jobs, which means this is the resume that represents them, so it seems to be the right way to go about it. That must mean I’m doing something wrong. So I asked Lydia to meet me for coffee, which she did, and I was very thankful. During my conversation with her I expressed my concerns. I tried to put into words what I was looking for in my next career move and talked the importance of finding the right fit for me. A fit not only in terms of the job itself but also the people, the culture and the company. Then I pulled out my resume, very shyly, and asked her to look at it. What she said to me that day ended up being just the kick I needed to move forward in my search. What I took away was the fact that it’s okay to have a personality. It’s okay to be authentic. There’s a saying that your vibe attracts your tribe, and I guess the vibe I was putting off would attract like-minded individuals or companies. Sure, my resume was more creative than the average but that would hopefully attract companies who value those same attributes, the types of companies that I would see myself working for and being happy with. Walking away after that conversation, I felt I had the confidence to believe in what I was putting forth and how I was presenting myself. I had always felt like that was the real me, but had started questioning whether being authentic might lead me to unemployment! And that’s not something you want to think about it. A career is important, so how do I balance getting a job with getting the right job for me. A little while later, I was having dinner with one of my friends and she informed me of a position that had opened on her team. I approached the hiring manager and asked him to have coffee with me. Even though I’d met him a couple times through IABC events and knew a bit about the company and culture, I wanted to hear about what he was looking for in a candidate. We had a great chat and all my doubts were out the window. I knew I had found my ‘right fit.’ I decided to pursue the opportunity and apply, knowing this wasn’t your conventional company. They valued the very same things I did, creativity, passion and thinking outside the box. My biggest strength: Adaptability and passion. I thrive in new, dynamic, changing environments and I’m willing to hustle hard.